By Hanmero in New Arrival on 2017-06-28 . Research has shown that a person’s attitude can be greatly affected by their environment. This is known as the ambiance of the setting and the manner in which it influences a person’s psychological well-being. Unfavorable settings or environment can prompt a negative psychological result and poor physical response. If the setting is favorable, the alternate response will be experienced. One method that can ensure a person experiences a beneficial atmosphere is the decorations in the room. This article will provide information on the wall coverings and how they can be advantageous to the resident in the home. It will focus mainly on the benefits of vinyl wallcovering here and their place in residential properties. In addition to providing an advantageous atmosphere regarding texture and color, vinyl wallpaper is highly durable. The water resistance finish allows the wallpaper to be placed in areas that may be too humid or moist for traditional wall covering. The humidity is damaging in certain areas to wallpaper leading to mold and bacteria growth, which can result in medical health problems. One of the greatest benefits to using vinyl wall covering is that it is easy to clean and maintain. The cleaning procedure is a simple wiping of the wall with a damp rag to leave it new and fresh. Traditional wall covering can stain easily; however, the water resistance of the vinyl wallpaper removes the chance of staining or stains soaking into the covering. This means it will last much longer than other covering styles. Unless the residence is new, there is a great chance that the walls will present with imperfections. The imperfections can take shape in different styles including cracks, uneven areas, and poor paintwork. Fortunately, vinyl wall covering can be used to hide these problems and remove the appearance of wall damage. The thicker the paper the easier it is to hide flaws in the property and make the property appear more attractive. If you are particularly worried about a certain surface, it is recommended that you install textured vinyl wall covering. Despite the promotion of eco-friendly processes, certain building materials and home decorative items continue to be created using toxins or harmful chemicals. Once the item is installed or placed in the home, it is able to release the chemicals into the air compromising the safety of people living in the building. One method to avoid this problem is using vinyl wall covering. The installation of vinyl wallpaper removes the placement of chemicals on building wall surfaces. This is due to vinyl covering being free of turpentine and acetone; therefore, there is no introduction of toxins into the environment. Vinyl covering is a popular choice for children’s rooms based on the increased indoor air quality level. Final words on the matter, Wallpaper installation is an important factor to consider when designing a personal residence. Using the information above, you can see that using vinyl wall covering can be beneficial for air quality and custom design. 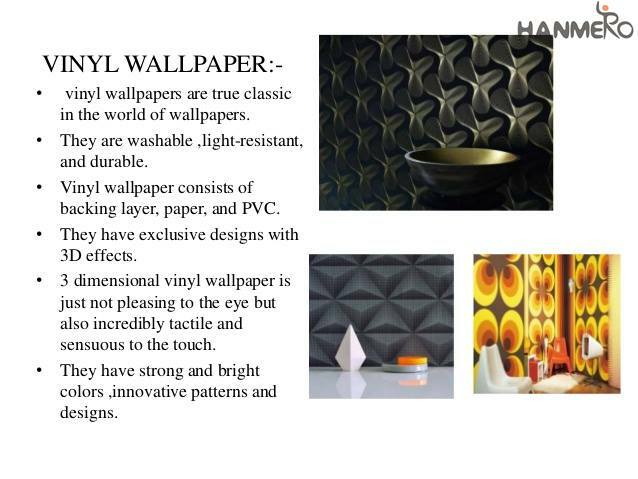 See more from our HANMERO.We are happy to assist you anythinng about wallpaper! HANMERO 3rd container order are ready to ship! Factory Price Unique Non-woven Mottled Bronzing Wall Paper 0.53*10M/Roll From China Supplier.